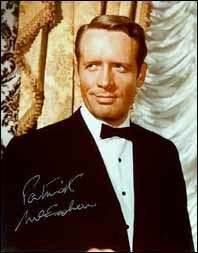 Autograph hunters often worry about the veracity of celebrity autographs they see for sale, but one place can always guarantee its items are genuine, - thanks to exclusive deals with Patrick McGoohan and other celebrities. At Larry Green's website jamesbondposterpage.com all autographs come with a certificate of authenticity signed by the relevant actor, - so in effect you receive two autographs for the price of one! Larry Green of Washington, USA, has been in the poster business since 1982, and has sold autographs since 1988. His site offers exclusive signed photographs of several star actors from spy tv/films and westerns. Several months ago, he got in touch with Patrick McGoohan to see if he'd be interested. Larry told us: "I contacted Mr. McGoohan directly and as Roger Goodman intimated in his interview, Mr. McGoohan tends to put you through a test. I can't divulge what it was but I passed to the point of getting that familiar Dr. Syn chuckle out of Mr. McGoohan. I understand fully why he does this and we have become close friends ever since". "Patrick is our favorite client and over the several months I have gotten to know him, I have learned that money is his least motivation in accepting a project," Larry continued. "I love the man and his values. His private life is more of an inspiration to what a human being should be than any character he could have ever assumed. He is a professional; the last of a dying race". "I sent Mr. McGoohan a bottle of ancient Irish Whiskey for Christmas last year and when he called to thank me he told me his doctor would not allow him to drink anymore. He added, "....but you know, Larry, it's good to know it's there in case of emergency!"